For thousands of years ungulates have migrated between seasonal ranges in the vast and beautiful landscapes of Wyoming. From mule deer and pronghorn that travel across the Red Desert to the wilderness journeys of elk and moose in the Greater Yellowstone Ecosystem, Wyoming boasts some of the longest and most spectacular migrations in North America. These epic, terrestrial migrations are to many a symbol of Wyoming’s vast intact landscapes. And although these migrations are part of the region’s cultural heritage, they are poorly understood and threatened by rapidly changing landscapes. Recent research at the University of Wyoming has broken new ground in our understanding of Wyoming’s ungulate migrations, raising awareness of the ecological benefits of these seasonal journeys, their rarity in a global context, and the threats they face amid accelerating land-use change. Although there is considerable interest in conserving ungulate migration routes in Wyoming and the West, a comprehensive story has never been told of Wyoming’s extraordinary ungulate migrations. To elevate awareness of this ecological phenomenon as a means of advancing conservation and management efforts. Wild Migrations draws upon a wealth of knowledge built through several decades of intensive study by biologists at the University of Wyoming, other state and federal agencies, and private firms. This atlas also benefits from the on-the-ground expertise of many of Wyoming’s wildlife managers. 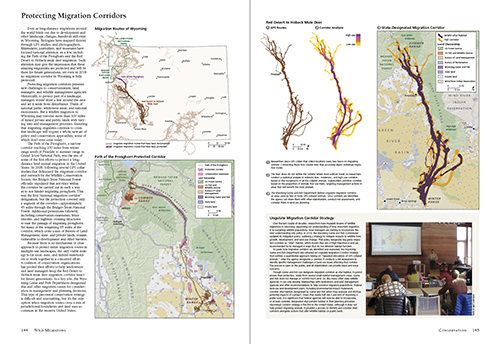 We partnered with the award-winning cartographic team at the University of Oregon Department of Geography’s InfoGraphics Lab (the producers of the Atlas of Yellowstone) to bring their expertise in design to create new visualizations of these magnificent migrations. 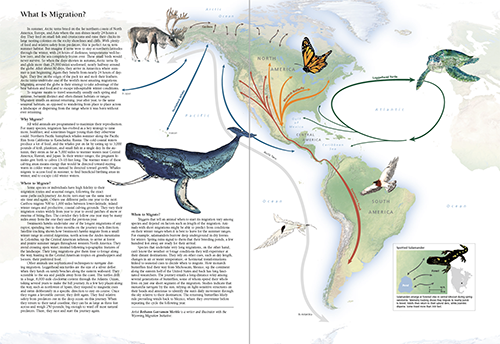 Facing pages in the Atlas cover more than 50 migration topics, ranging from ecology to conservation and management, illustrated with data-rich and visually stunning maps and graphics. 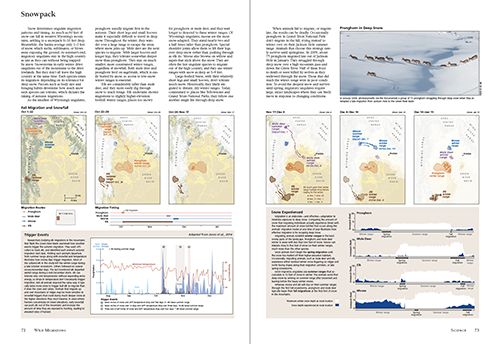 Page pairs illustrate topics such as the Teton bighorn sheep and their response to the loss of historical migration routes and the expansion of energy development in Wyoming and the challenge this poses for long-distance migrations. Wild Migrations is a large format reference book. In addition, select migration stories from the Atlas are accessible on this website in an interactive format (with animations, interviews, and other links). The production team of the Wild Migrations: Atlas of Wyoming’s Ungulates included Matthew Kauffman (senior editor), James Meacham (cartographic editor), Hall Sawyer (associate editor), Alethea Steingisser (production manager), Matt Hayes (spatial analyst), Bill Rudd (contributing editor), and Emilene Ostlind (text editor). Lauren Tierney, Megen Brittell, and Emily Nyholm at the University of Oregon contributed to cartographic design and production. 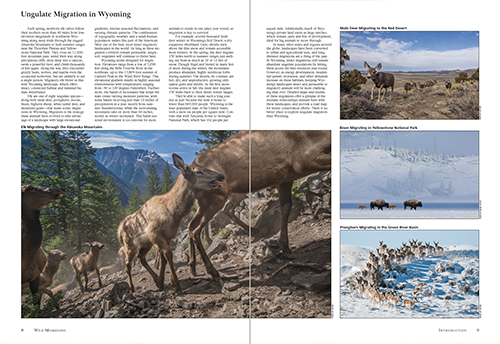 We are grateful to the UW Office of Research and Economic Development, the Knobloch Family Foundation, and the Biodiversity Institute at UW, who first supported our idea of telling the stories of Wyoming's migratory ungulates. Other key funders include the Wyoming Governor's Big Game License Coalition, the Wyoming Department of Transportation, the US Geological Survey (Wyoming Landscape Conservation Initiative), the George B. Storer Foundation, the Greater Yellowstone Coordinating Committee, the Community Foundation of Jackson Hole, the Rocky Mountain Elk Foundation, the Wyoming Game and Fish Commission, and the Wyoming Foundation for Wild Sheep. 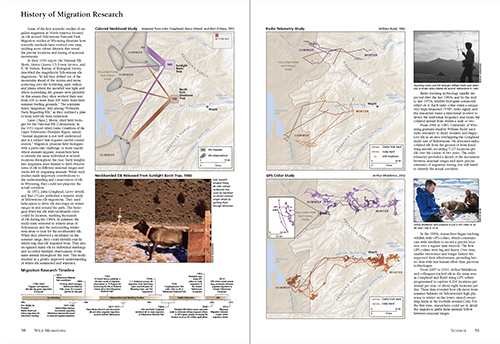 In the spring of 2012, the Wild Migrations: Atlas of Wyoming’s Ungulates was just an idea. 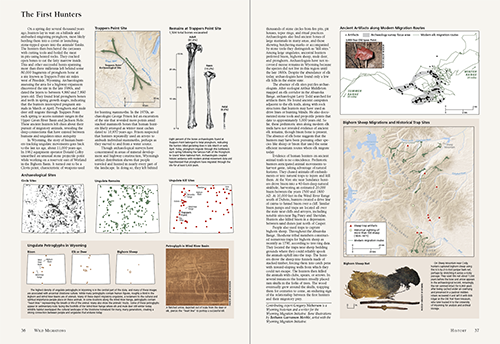 Over the next two years, we formed a strong partnership with our cartographic team at the University of Oregon, outlined the entire Table of Contents, and raised enough funds to begin work. We are now in full production mode, with approximately 40 page pairs in various stages of production. In addition, several of the Atlas maps and graphics have been viewed by the public in other interpretive venues, such as the current Path of the Pronghorn photo exhibit at the Buffalo Bill Historic Center in Cody, WY and the Red Desert to Hoback mule deer migration photo exhibit. 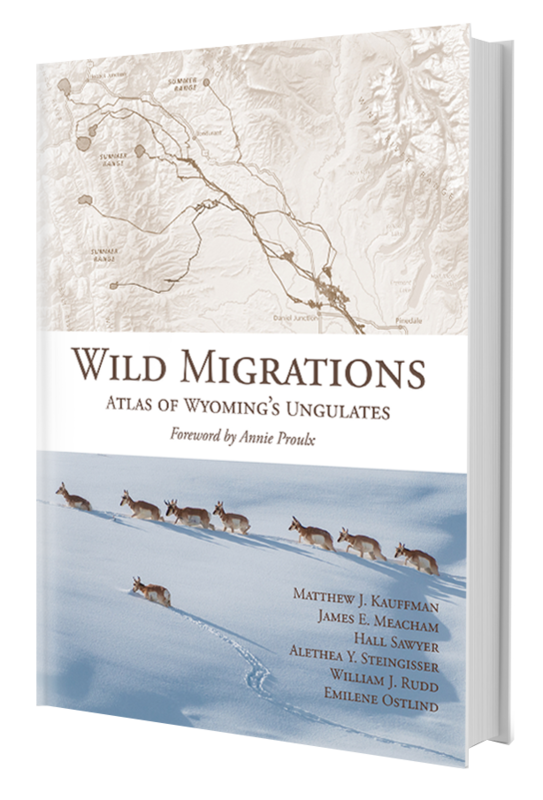 We are seeking other interpretive venues for the public to see and learn from the Wild Migrations: Atlas of Wyoming’s Ungulates content as it becomes available. 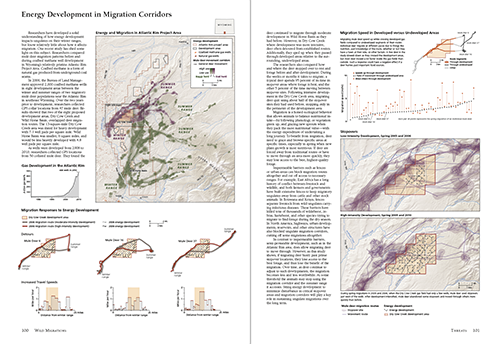 Wild Migrations was published in October 2018.